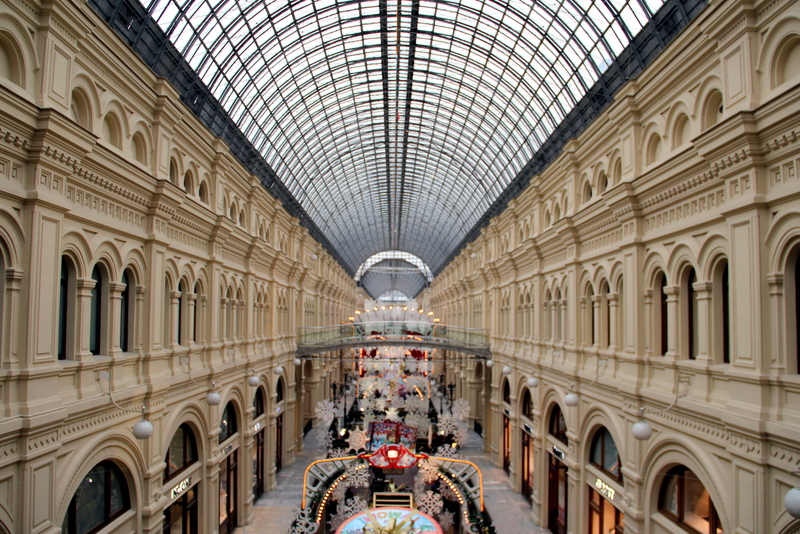 We took a break to warm up and recharge energies at GUM, an impressive department store, definitely worth a visit. 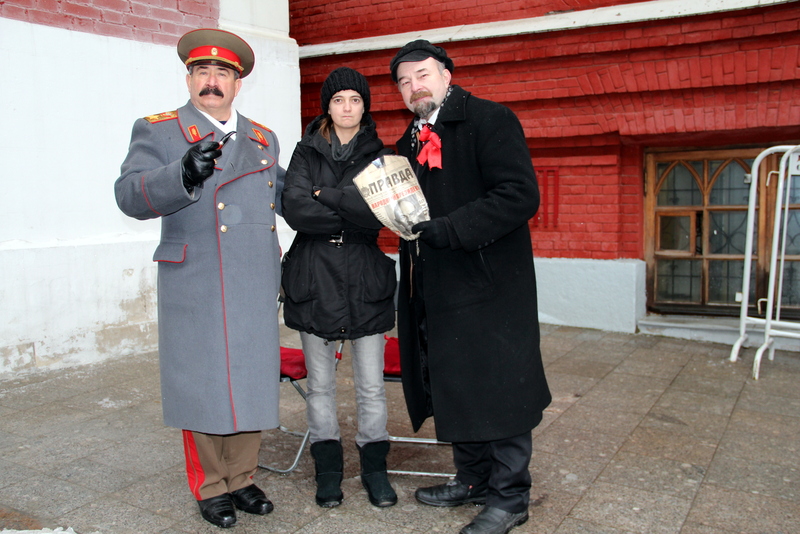 It was too cold to attempt the Kremlin, and getting dark quickly, so we headed to the Armoury museum. This chamber, located on the south-west side of the Kremlin, contains an amazing collection of weapons, regalia, arts and relics. My favorites were the Faberge eggs and Empress Elisabeth’s sledge. 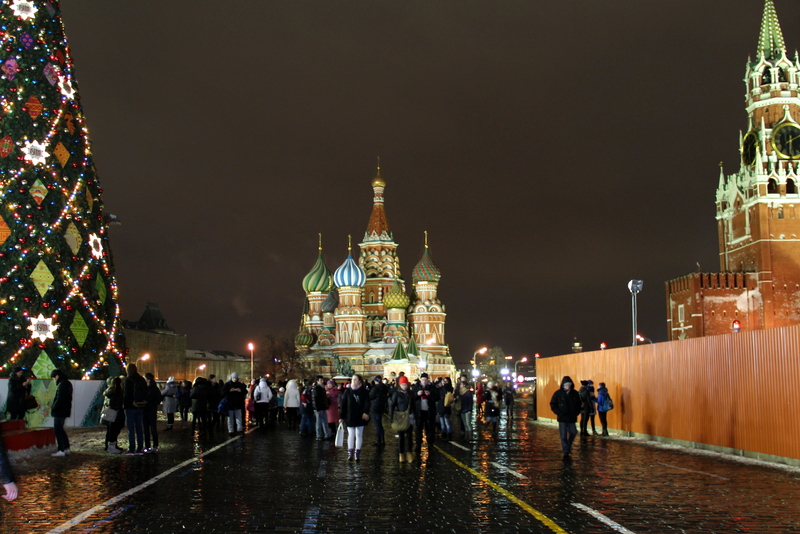 When we got out, it was pitch dark, and walking back to the Red Square, we enjoyed some of the most beautiful night scenes I’ve seen in the world. 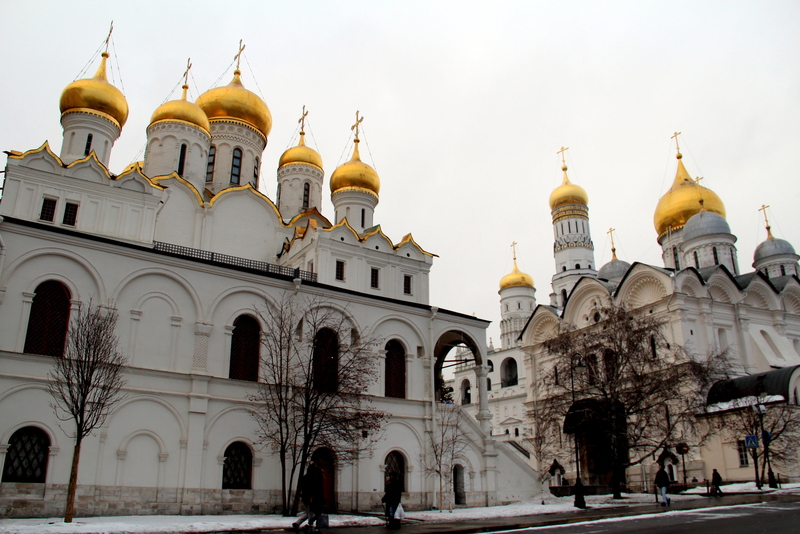 On our second day, after walking around Kitai Gorod and enjoying a traditional brunch in a family restaurant there, we made our way to the Kremlin. The Moscow Kremlin is a huge, triangular citadel that contains several palaces and cathedrals, and is the official residency of the President of the Russian Federation. 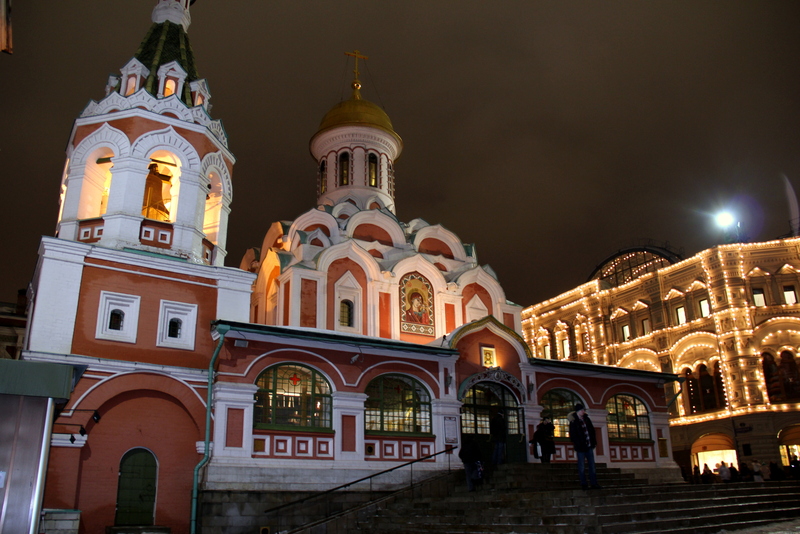 The most important sites are the Cathedral of the Annunciation, Cathedral of the Dormition, Cathedral Archangel, Church of the Twelve Apostles (all around Cathedral Square, with classic golden domes and interesting iconostasis), the broken Tsar Bell (impressive, behind Ivan the Great Bell Tower), the Palace of Facets, and the Spasskaya tower (on the way out). It’s worth allocating 3 hours to this visit, including getting tickets and waiting in line to enter. We devoted the rest of the day to checking out metro stations. 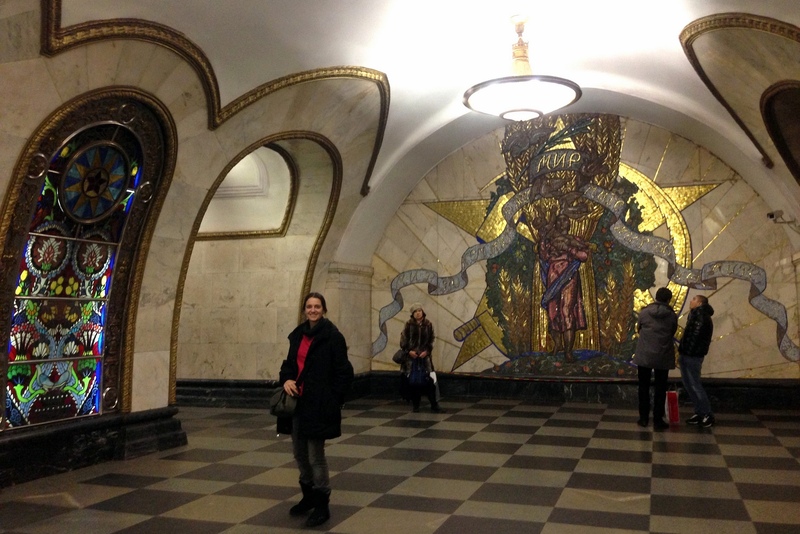 The Moscow metro was built in the 30s, and far from reflecting the sober Soviet style, it’s the most extravagant transit system in the world. Stations have high ceilings, marble walls, bar-reliefs, mosaics, stained-glass windows, bronze statues… and feel more like palaces than anything else. The most famous ones are Komsomolskaya, Novoslobodskaya, Mayakovskaya, Elektrozavodskaya, Ploshchad Revolyutsii, but there are many more that make it worth getting lost in the system. 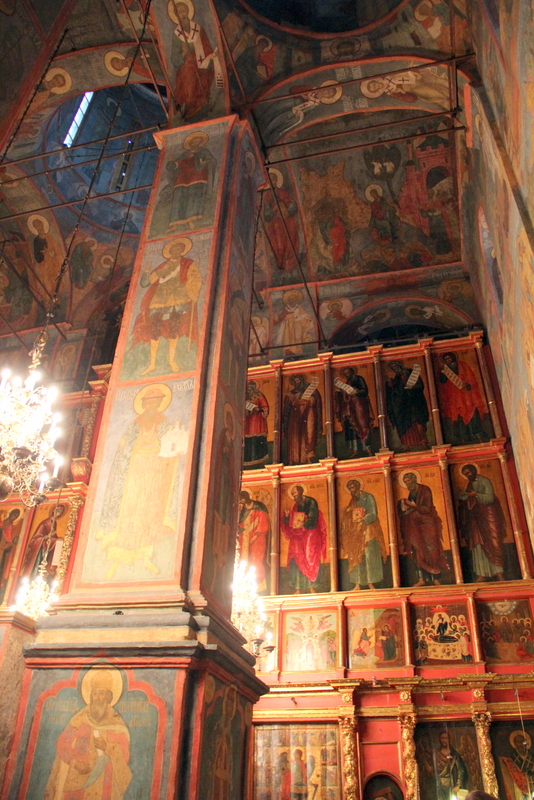 We emerged from the underground to an exquisite sighting: the Church of St Nicholas Khamovniki. 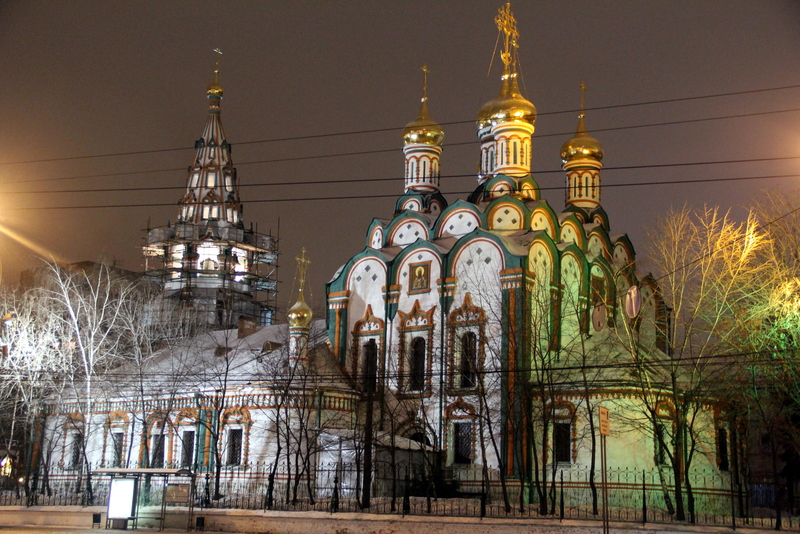 Because of these two nights, the illuminated temples in the cold night are my fondest memory of Moscow. 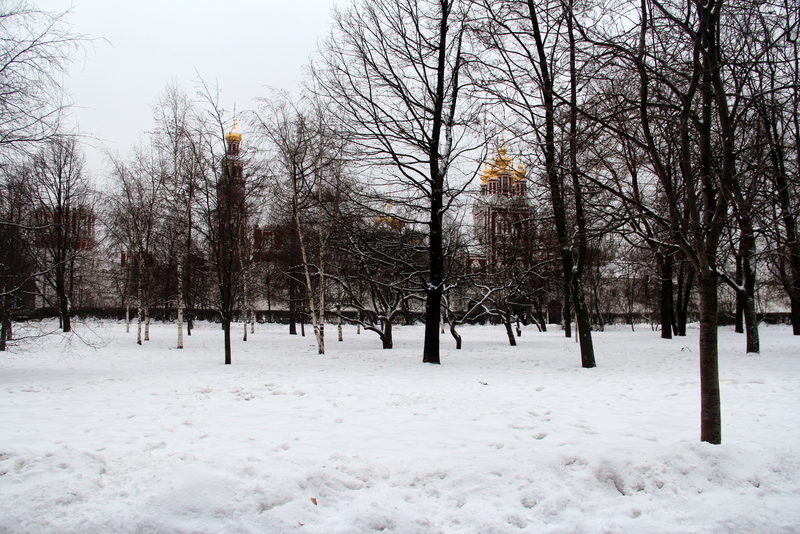 On our last day, we began by visiting the Novodevichy Monastery, a charming complex, which was covered in snow and full of kids playing. 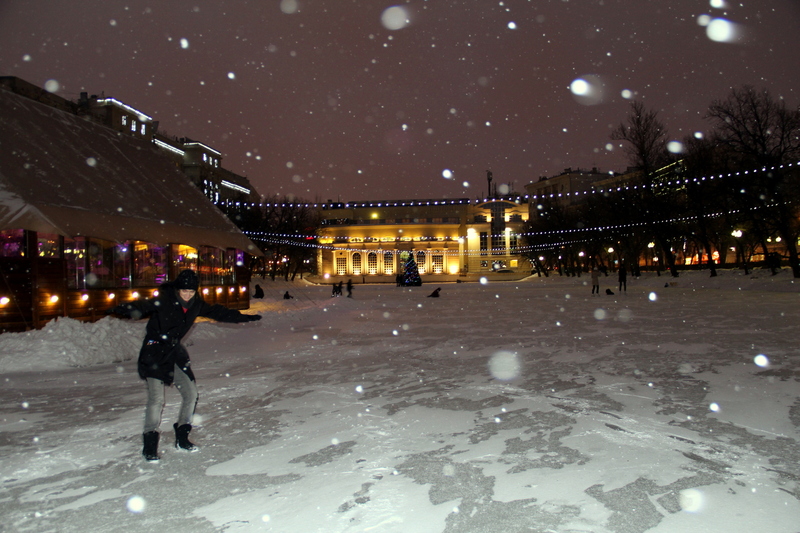 We also checked out the Cathedral of Christ the Savior (too tacky imho), walked by the frozen river to the giant Peter the Great Statue and chilled in Gorky Park, where Muscovites were showing off their skating abilities. Before we even knew, it was time to get on the awesome metro again, and head back home. 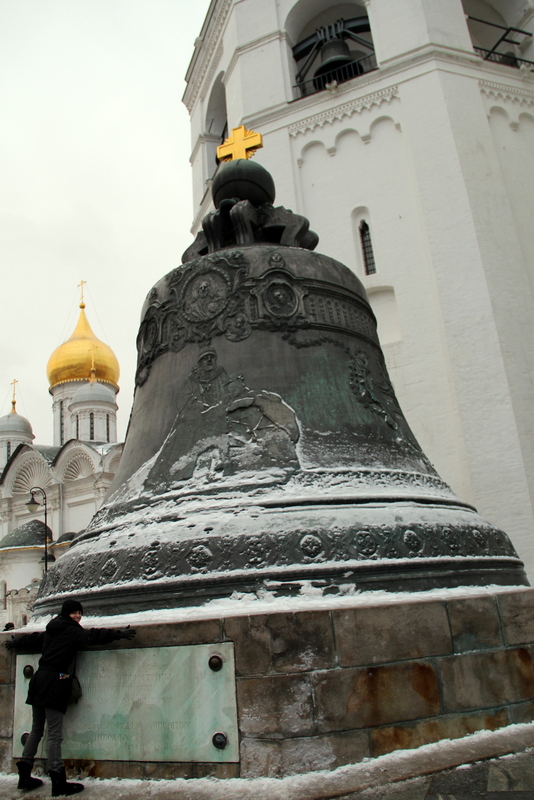 Cool, thanks for sharing your experience from visit to Moscow! 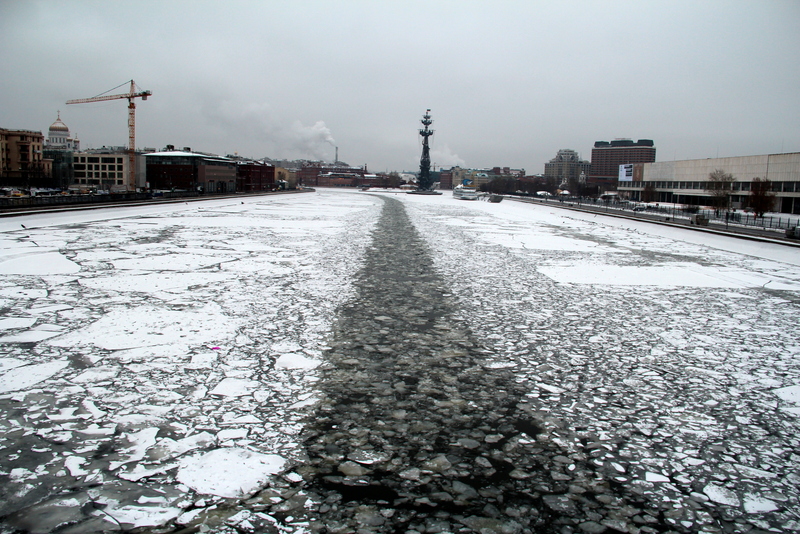 Did you get a chance to go to St. Petersburg too? Yes, I did visit St. Pete too and loved it! Great experience, but I think you need at least 4-5 days for Moscow to see extra places. I’d suggest Bolshoi Theater, Planetarium if you like space, Moscow city if you like Skyscrapers and modern stuff, VDNH to see very cool exhibitions etc. 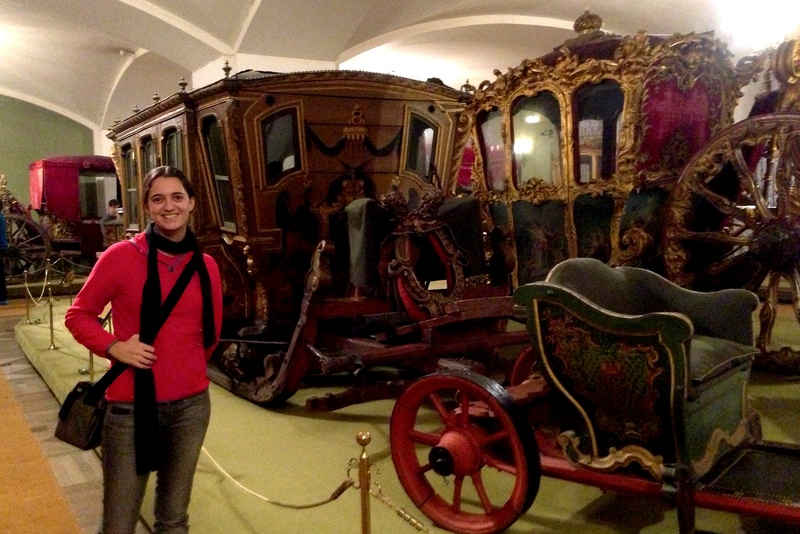 St. Petesburg may need at least 3 days or more, Hermitage, Catherine palace and many more are sure worth visiting. The best time to go is from May to mid October for yellow autumn. how cold was it when you visited? I plan to visit in December this year.